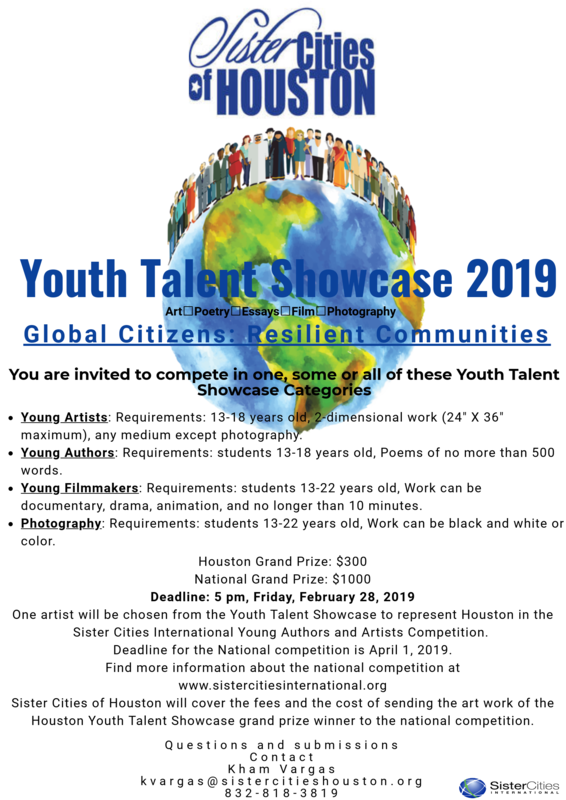 The 2019 Youth Talent Showcase National Deadline is April 1, 2019. Dr. Helga Aurisch will lead us on one of her excellent tours of the Van Gogh exhibit at the Museum of Fine Arts on Thursday, April 18, 2019. Please find information on payment and RSVP below. You experience a special occasion when Dr. Helga Aurisch leads you through an art exhibition. Her humorous affection for the artist, the art, and the life and background that created both comes to life before your eyes. The excitement increases exponentially when the artist is Vincent Van Gogh – he experienced the heights and low points of life, all mirrored in his paintings. Do join us on Thursday, April 18, 2019 for a tour with Dr. Aurisch. Our last tour in November drew close to 70 persons, which is too much. The museum has asked us to divide into two groups, one at 6:30 p.m. and one at 7:30 p.m. The cost for the tour is $22 for persons under 65, and $18 for those above 65. If you are a member of MFAH, you can get a free entrance ticket from the museum, but you must register with us to participate in the tour. We are limiting each group to 35, and we must offer the tickets on a first-come-first-served basis. So, please send in your reservation now! Save the date for the annual Taiwan Yes! Festival at 5885 Point West, Houston, 77036. Check back for more details about food and entertainment! The monthly SCH board meeting will be held on April 30, 2019 from 4:00 pm to 6:00 pm.